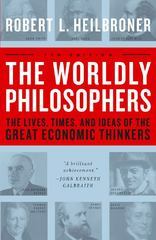 The Worldly Philosophers 7 Edition The bestselling classic that examines the history of economic thought from Adam Smith to Karl Marx—“all the economic lore most general readers conceivably could want to know, served up with a flourish” (The New York Times).The Worldly Philosophers not only enables us to see more deeply into our history but helps us better understand our own times. In this seventh edition, Robert L. Heilbroner provides a new theme that connects thinkers as diverse as Adam Smith and Karl Marx. The theme is the common focus of their highly varied ideas—namely, the search to understand how a capitalist society works. It is a focus never more needed than in this age of confusing economic headlines. In a bold new concluding chapter entitled “The End of the Worldly Philosophy?” Heilbroner reminds us that the word “end” refers to both the purpose and limits of economics. This chapter conveys a concern that today’s increasingly “scientific” economics may overlook fundamental social and political issues that are central to economics. Thus, unlike its predecessors, this new edition provides not just an indispensable illumination of our past but a call to action for our future.